What will they think of next? That is always the question I ask myself when I find out about a new product that Purex has released. The creativity of the team at Purex is truly inspiring and they never cease to amaze me! I have heard of laundry enhancer before and have tried some scent-boosting products but never stuck to any of them because they were either too strong or way too expensive for my budget. I could never justify spending oodles of dollars on something whose purpose was to just make my clothes smell nice. When I heard about Purex Crystals Limited Edition Fabulously Fresh I was instantly intrigued. How would it smell? Would it work as well as I thought it would? Would my laundry seriously smell fresh for weeks? I had to find out. So, for this review I was sent a bottle of Purex Crystals Limited Edition Fabulously Fresh and as soon as I opened the box, it smelled amazing. I am one that loves to have my laundry smell nice so whatever I can do to help sustain the freshness is wonderful. As usual, the timing for this arriving was impeccable. These crystals arrived on laundry day and so I was eager to try them out immediately! The Fabulously Fresh Crystals are lime green in color and again, the smell is fantastic. The cap has helpful lines imprinted on the side to show you how much of the crystals you should use for different size loads of laundry, which I always find helpful. I tend to over-measure so having a guide is great. All you do with these crystals is dump them into your washing machine along with your detergent and let them work their magic! Because they go in at the start of your washing cycle, they infuse the laundry longer which equals longer freshness. With each load of laundry that I washed and dried, I was so impressed by how good my clothes smelled. Even my children's clothing smelled nice and even after a few days of being in the drawers, the clothes still smelled like they had just come out of the dryer. I have been using Purex Crystals Limited Edition Fabulously Fresh for about a week now and have done multiple loads of laundry and can honestly say that I love these crystals! They are true to their name and really do make my clothes smell amazingly fresh and beautiful. I plan on buying more when I run out and hope to keep using them in the months to come!! Purex Crystals Limited Edition Fabulously Fresh is available for purchase in major retail and grocery stores and retails for $6 or less. To celebrate the release of the New Purex® Crystals Limited Edition Fabulously Fresh, the Purex® brand will be hosting the Bring on Spring with a Fabulously Fresh Wardrobe Sweepstakes. 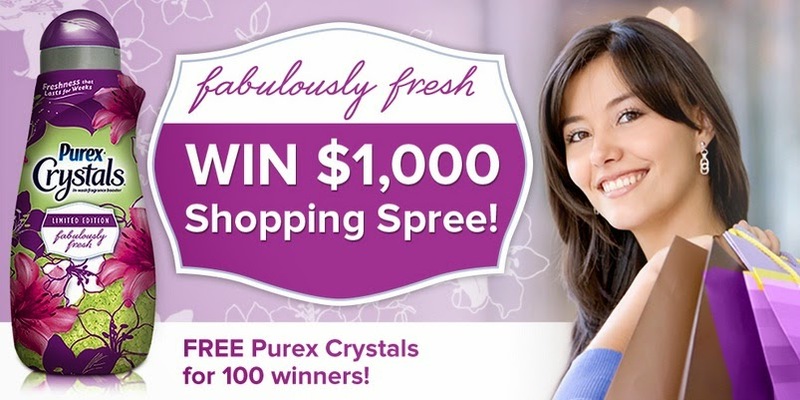 One grand prize winner will receive $1,000 and a year’s supply of Purex® Crystals Limited Edition Fabulously Fresh while 100 2nd place winners will receive a coupon for free Purex® Crystals Limited Edition Fabulously Fresh! Click HERE to get your entry in today! Disclaimer: As a Purex Insider, I received no monetary compensation for this post. Purex did provide me a free sample of their Purex Crystals Limited Edition Fabulously Fresh for review purposes. All quotes and stock photos are from the Purex website and email. Prizes are in coupon form and will be mailed by myself. This blog is not responsible for lost, damaged or stolen prizes and in this case, I am not responsible for replacing coupons under any circumstances. All thoughts and opinions are 100% mine. The Purex with Oxi packs. I want to try the Purex No Sort detergent. I love the dryer sheets. I have used the Purex plus Oxi liquid detergent and feel it works great and is cost effective. I would like to try the Purex Ultrapacks. I would like to try the Purex detergent with Oxi. I think I have used almost every Purex product on the shelf. Purex Crystals are my favorite. I use Purex Crystals for baby in every load and I love them! I have used the purex crystals before and love the scents. I cannot wait to try the new scent. I have used the purex crystals and I really like them. I use Purex Crystals and I love them !! I have used Purex Crystals and love them. They make your clothes smell great for a long time. I would love to try the Purex Crystals Dryer Sheets. I would like to try the purex no sort. What is one Purex product that you have used or would love to try! I like the fresh mountain breeze crystals. I'd like to try the Purex with Oxi. I like their Laundry Soap and use all of their scents. I would love to try the crystals. I'd like to try the Purex UltraPaks Detergent. They're so clean and easy to use! I love the Purex plus Oxi. It's my two favorite laundry items all in one. I want to try the crystals. I keep seeing the commercial for the no sort detergent...I'd like to try that. I would love to try the Purex with Oxi Packs. I absolutely love the Purex Natural Elements. It's a staple in our laundry room. I love Purex with color safe bleach! I would like to try the Purex No Sort for Colors detergent. i want to try the no sort detergent. The crystals are my favorite purex products! I use Purex Natural Elements Linen & Lilies.